Happy Monday and beginning of the Thanksgiving Week festivities! Unfortunately, my current moving situation has thrown a wrench into my outfit posts, but I'm so happy to have lined up this awesome giveaway with a great group of bloggers! 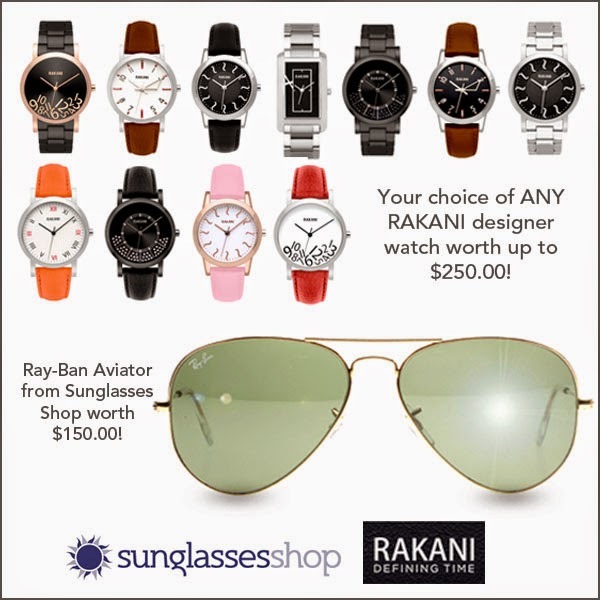 In this giveaway, one lucky winner will any RAKANI designer watch (below $250) of their choice AND a pair of Ray-ban aviator sunglasses ($150 Retail value) from Sunglasses Shop- a prize worth a total of $400!! To enter simply follow the Rafflecopter below. RAKANI - The Rakani story began in March 2012 when founder Chirayu Patel gave his girlfriend a watch for her birthday. She jokingly asked if the watch was meant to keep her from always being late. Although it wasn't, it made him realize that watch designs today have no particular meaning behind them. This idea inspired the premise behind Rakani, which is to create meaningful designs that have significance beyond the product itself. Sunglasses Shop – One of the leading online retailers for name brand sunglasses and prescription glasses and is a certified Ray-Ban dealer. Giveaway is open to residents of the US, UK, AU, & CA who enter via the Rafflecopter widget below. Running Time: November 24 and will end on the 12 midnight of December 4.